UCF graduate student David Nash and his team are developing a smartphone-based handheld drug test system for law enforcement applications. The team has been selected to further advance their innovation at the national level through the National Science Foundation (NSF) I-Corps program. 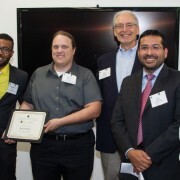 The team was part of the first cohort to participate in UCF’s I-Corps program. UCF’s “smartphone drug test” I-Corps team (from left to right) -Terry Pierce, industry expert and team mentor, David Nash, UCF graduate student and the team’s entrepreneurial lead, Richard Blair, Ph.D., UCF Physics Department and CATER professor and the team’s principal investigator, along with Jerry Engel, co-founder and leader of the Lean Startup movement, Ivan Garibay, Ph.D., program director, UCF I-Corps Site and Tom O’Neal, Ph.D., executive director, UCF I-Corps Site and associate vice president, UCF’s Office of Research & Commercialization. With its participation in the national program starting in January, the team will continue to receive expert guidance and a $50,000 grant in support to further develop and refine their technology, and to conduct market, and customer validation. In addition, Nash, a Ph.D. student in chemistry, also recently earned the university’s first National Institute of Justice (NIJ) Graduate Research Fellowship in Science, Technology, Engineering and Mathematics award of $50,000 to fund continued work on a prototype. The NIJ is the research-funding branch of the Department of Justice. Annually, it provides a monetary award to a handful of graduate students to conduct research in the social or physical science fields that will help the criminal justice, law enforcement, or forensic communities. The UCF “smartphone drug test” I-Corps team—which includes Nash as its Entrepreneurial Lead, UCF Physics Department and CATER professor Richard Blair, Ph.D. as its Principal Investigator, and Terry Pierce, who with more than three decades of corporate experience in business development and product management acts as its Mentor—are developing a system that leverages spectrometry, smartphone and cloud technologies to allow law enforcement and forensic analysts to rapidly, accurately and safely identify substances of abuse in the field. In a typical field situation, law enforcement professionals who need to determine the identity of an unknown substance often must conduct a complex and multi-step process utilizing caustic chemicals to appropriately handle and gather the substance, perform the testing and visually interpret the results. With the team’s smartphone spectrometer system, the law enforcement professional introduces a tiny sample of the unknown substance into a handheld spectrometer. The spectrometer features luminescence technology which measures a unique signature of the substance. The smartphone’s camera is used to take a photo of this image which is then analyzed via an app, developed by the team, which digitizes the image and compares it with a cloud-based reference data library, providing the identity of the substance to the smartphone screen within seconds. In addition to law enforcement, this analytical technology can be used in a variety of forensics, military and other field-test applications. The team is engaging with several Florida-based law enforcement agencies as well as other law enforcement agencies throughout the country to test the system. Nash anticipates that a beta version of the system will be available early next year. The University of Central Florida (UCF) has partnered with the National Science Foundation (NSF) to deliver one of the agency’s flagship programs as an I-Corps Site. The I-Corps Site’s purpose is to foster innovation among faculty, students, and local entrepreneurs, to nurture and support them as teams to transition their ideas, devices, processes or other intellectual activities into the marketplace. The UCF sites program is part of a national innovation network consisting of 37 universities nationwide. The primary goal of NSF I-Corps is to provide university scientists and researchers the program, process, and resources to investigate and validate the commercialization potential of their science to benefit society. For details visit ICorps.cie.ucf.edu.